VISA Global Logistics is one of Australia’s largest privately owned international freight forwarding companies, offering an extensive global network that delivers a comprehensive logistics system for their customers. A combination of VISA’s focus on personal service, an experienced team and real time management systems has led to strong growth and the need to expand their fleet of Reach Stackers as they take on new demand. VISA’s newest distribution center recently opened for business at a state of the art facility in Erskine Park, Sydney. 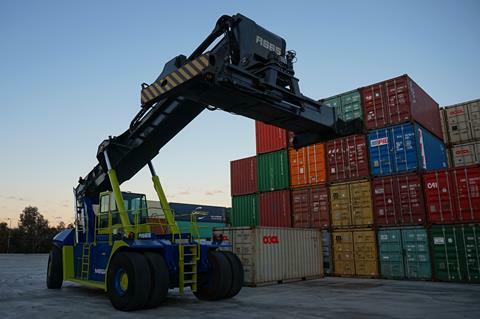 The demands on the facility are high, as VISA continues to grow, and the operation mandates the equipment provide high levels of reliability and performance, whilst operating for long durations of high cycle and load container movements. 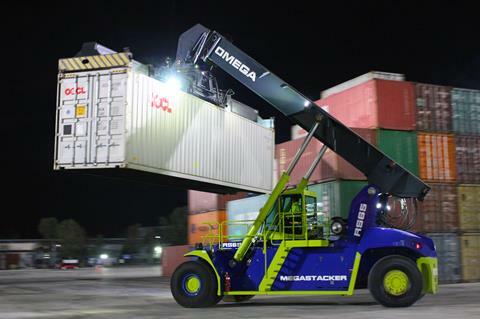 Critical to VISA’s continued success is partnering with equipment manufacturers that can deliver on these requirements, a key reason for VISA’s ongoing purchases of the Omega RS65 Reach Stackers as their “truck of choice”. The two Omega RS65’s on site at Erskine Park are designed with a heavy duty boom, load sensing hydraulics and robust assemblies. The RS65 is rated to full lift height with a 42 tonne load, with precision controls and a superior design, ensuring maximum stability and residual capacity in heavy duty applications. Omega’s commitment to reliability is built into the RS65 with only the best quality componentry including American made Cummins engine, European manufactured Kessler axels, Dana transmissions and ELME top lift frames. And for added confidence all of this is backed by Clark Equipment’s superior servicing and technical support. High intensity applications require a tough truck, but operator comfort and safety, especially when operating for extended periods, is critical. Omega’s RS65 delivers on ergonomics with features including an easy use LCD touch screen and luxury heated seats. Safety is front and center with the RS65’s superior stability, refined dynamic control systems, circumferential hand rails around the cabin and the slim line ‘A Pillar’ cab, designed specifically to withstand significant impacts whilst maintaining occupant protection and structural integrity. Safety continues past the Erskine Park site with fully fitted Solace compliant weigh system providing confidence in container specifications on loading. Omega’s range of heavy trucks are Built Smart. Built Tough. Built Here. Contact us today for solutions that deliver for your businesses.